To celebrate the Beton Hurlant exhibition in Paris, isTia.tv is dedicating a couple of posts to French Skaters that went beyond the extra miles so that skateboarding could still live. To copycat a French analogy, those skaters were the “irreductibles skaters” of the 80’s and 90’s. Here is a guest post of Jean Noel Felisot, vert rider of the 80’s and 90’s. After 1980 we remained only four skaters in my small town of Chaumont. It was the desert after the skateboarding gold rush of the late 70’s. We were fortunate enough to have a small concrete skatepark that had no vert but that we found nice enough to skate. One day I met an American at the skatepark who had moved to Chaumont and this changed everything in my life. When he arrived, he showed us his collection of SkateBoarder Magazine and he especially showed us pictures of his ramp in the United States. That was the first ramp that I ever saw with flat in the middle. We decided to build a quarter pipe on the flat part of the skatepark, 3meters high with a good vert section. It was like paradise. One day that I was visiting Paris, I made the acquaintance of a skater who loved vert too. Together we skated a couple of spots in Paris like the Jardin D’acclimatation and Villepinte (that I loved). This is also at the Jardin D’acclimatation where I met Christophe Bétille for the first time. He had just bought his first vert board. After that, I went on the tour to the Championnats de France but it was seriously boring because there were no more vert ramps on the contests. But one day during a championship at Vierzon in 1982 I met all the gang of Bourges [Nico, Christophe, Fred etc] and this changed all again! It was the first time I saw skater with skatepark decks at a French Championships (on top of me of course). We immediately felt we were part of a community and “cerise sur le gateau” that day, the Club De La Rochelle was there also. All of a sudden we were fifteen skaters to love vert riding. 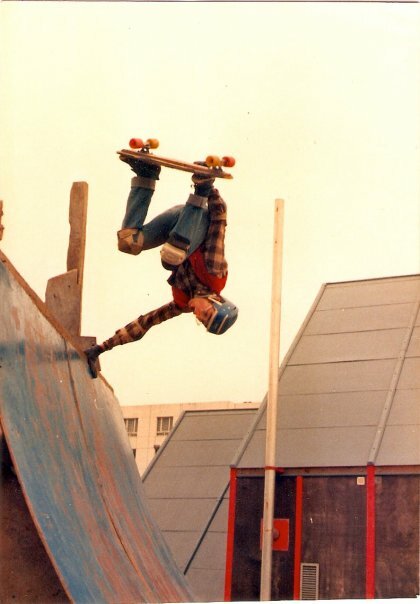 The rest of the story is a big part of the development of Vert in France: The Bourges Cavernous Contest was the first French ramp Championship, and it was in Rouen in 1983. Then, there were the Bourges camps with the American pros..... While I was still being good friends with my American buddy, I decided to move to the United States in 1988. I skated like until 1995. I was going very often to Jeff Phillips skatepark in Dallas. I met PAS in 1988 in Oklahoma City, it was a demo for swatch. We became very good friend until the day I went back to France in 1995 and we lost sight of each other. This year I started to ride vert again!